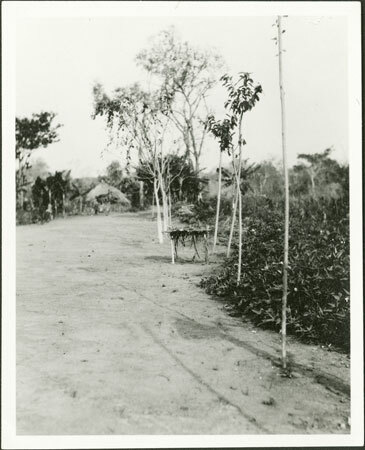 A view down a Government constructed road in a settlement, with a 'medicine-hut' at the verge. There are also fig-trees (Ficus platyphylla) growing along the road side, from which barkcloth is made (roko). Added Accession Book Entry - [In pencil in column] Catalogue room. Note on negative m/s ink - "207"
Morton, Chris. "Zande road with medicine hut" Southern Sudan Project (in development). 03 Jan. 2006. Pitt Rivers Museum. <http://southernsudan.prm.ox.ac.uk/details/1998.341.124.2/>.